The end of hands in the dirty water: with Leifheit set Mop press, which consists of the bucket Profi with insert for pressing and the floor wiper Profi micro duo, cleaning with dry hands and without bending down is possible. And this is the way it works: remove the wiper cover from the frame by foot operation and put it into the press. Then operate the press by foot without effort. The wiper cover becomes as dry as wrung out by hand. The floor becomes dry in no time. 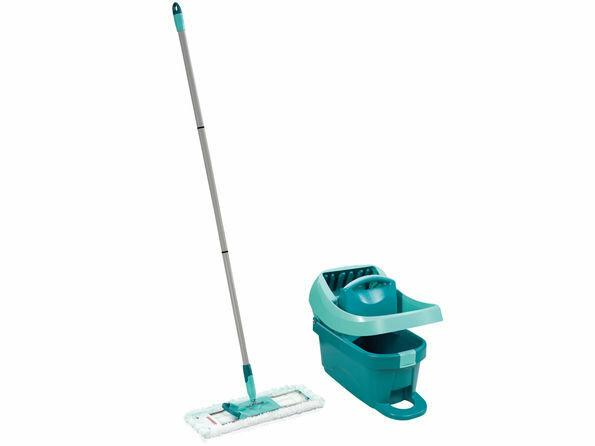 The thorough cleanliness on all floors causes the floor wiper Profi micro duo, which is included in the set. Its 2-fibre wiper cover has numbers of fine bristles, which stick out a little bit and reach the smallest hollows. They remove even persistent dirt thoroughly and pore deep. With its imposing wiping width of 42 cm it saves many working steps and valuable time. The ingenious 360° rotating joint enables the efficient cleaning in wavy lines and revolves around table- and armoire-legs. In 2009 floor wiper Profi micro duo won the first place in “Stiftung Warentest”. Only two floor-wiping systems got the mark “gut” (good). Both were from Leifheit. Leifheit offers the Roll base Profi as an accessory.